Why Pay More? Visit ProHealth Online Store for Special Offer & More Products. Therapeutic moisturizing and lubricating cream for dry skin conditions such as psoriasis, xerosis, ichthyosis, various eczemas and related hyperkeratotic conditions, as well as for diabetic skin care. It provides extra potency for relief of extra dry skin by dissolving dry, damaged cells. 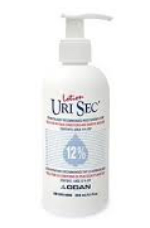 UriSec® Cream 22% is highly recommended by dermatologists. Therapeutic moisturizing and lubricating lotion for dry skin conditions and diabetic skin care. It effectively moisturises, softens, and revitalizes the skin. This lotion easily penetrates the skin to provide a quick soothing sensation and keep the skin well hydrated. Powerful formulation for dry and thickened skin conditions associated with dry and rough skin, psoriasis, xerosis, ichthyosis, eczema, keratoderma, corns, calluses, and damaged, ingrown and devitalized nails.